At FOSSGIS I was asked to try to install qgis on a very small android phone, I think it was a 3.2″ screen. the install went smoothly after making some space but then the problems came because of the small screen. Eventually I thought about setting a smaller font size to make the UI scale more, the problem was that it was impossible to get to the size setting because the UI was to big. On the next start the whole gui was nice and small and fitted the screen. Here some screenshots from my Samsung galaxy 9000 with 4″ screen and a video demonstrating digitising (with pen and fingers), GPS, compass and zooming on the phone. which problem? this post is about solving the font size problem. I get “Fatal error” .. testing all the version availables using QGIS Installer over Motorola Defy. Any comments about the minimum requirements ? When I run QGIS for android, the following message: The application has caused a serious error and can not continue. My phone is a Motorola Defy. I’m trying to run QGIS Mobile on my HTC Flyer P510e (Android 3.2.1). I downloaded and installed the software without any problems but now…I’m having difficulties in opening rasters and shapefiles! I tried to copy the files both in the memory of the tablet and in the MicroSD but I don’t manage to have access to them! Is there any particular directory I should use to save the files? did you run the qgis first run? then there should be a link called storage. or try the go up arrow in the file open dialogs. I’m writing a short article about QGIS and would like to use one of your QGIS for Android screenshots. Hope you are ok with that. ho avviato “qgis first run” ma non trovo da nessuna parte il link chiamato storage di cui mi parli. Dove dovrebbe essere? Quando provo a caricare file (raster o shape che siano) come farei nella versione desktop (Add Vector Layer o Add Raster Layer), seleziono “File” tra le Source Type e poi, tapping su Browse, cerco la directory in cui ho salvato i miei file non compaiono le cartelle che sono nella memoria del tablet bensì delle altre che per quanto ne so non esistono. Potresti suggerirmi altre possibili soluzioni al problema? Once runned QGIS Mobile on my HTC Flyer P510e (Android 3.2.1), I’m trying to open shapefiles and rasters. Just while tapping “Open” to charge maps or whatevere, the application closes! Should I install extenctions or addtional components? Sometimes, any toolbar resize to full screen (layer, gps,…) and it´s imposible to resize it back. Shut down qgis, try to change icon size, etc in Settings, but doesn´t work. Reinstall qgis is the only solution, but there is always a risk that any tool bar resize to full screen….. I think it doesn´t work, as I tried to hit every botton, frame, etc. in QGIS and android buttons. I am new in Android. android settings> applications> qgis> clear application data it´s good, thank you!. I always worked with Arcpad but want to change. 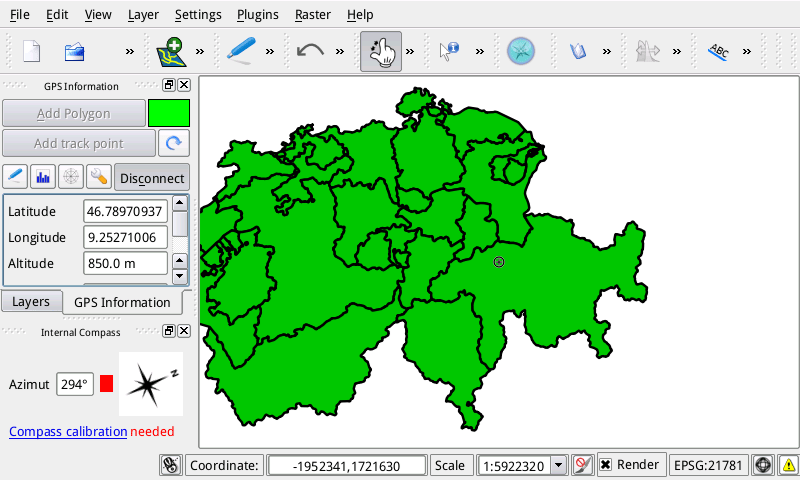 About QGIS, it´s really fantastic for PC, but I miss a kind of QGIS mobile or lite, for tablets and phones. With a simply funcionallity: layers view, MrSid, GPS offline, edit vector, attach pictures…. is there a way to copy myQGISConfigFile.conf to the path /data/data/org.qgis.qgis/files/Settings/QuantumGIS/ on the device with an application from my PC, such as Android Commander? I’ve searched for that path, but /data/ folder on my GS2 is empty, where I can find it? my device is rooted, but the /data/ folder it’s showed as empty in Android Commander, even if I’ve set as visible hidden and system files. Anyway, I solved this issue pasting the entire path into Android Commander. I’ve pulled the existing QGIS.conf file from the device, added the section [General] with the parameters you suggested and now the main interface of QGIS i much more readable. But the other windows (e.g. to load the layers or connect to to a WMS service) are still with big characters and dimensions that does not let some buttons to be pushed. Is there a way to set font size and button dimension even for the windows? It’s working on Samsung Galaxy S with Android 2.3.3. (Changing the settings with a conf-file did the trick for such a small screen.) However, QGIS seems a little bit unstable – shutting down qute often in the middle of different operations like adding a shapefile, creating a new shapefile, adding a WMS etc. Is this due to my “old” phone? Will it be better on a newer phone (e.g. SGSIII or tablet) with a newer version of Android and/or is a new version of QGIS Android to be expected soon? I would like to use QGIS on Samsung tablet for collecting data (digitizing/GPS) during field work. no, it is not phone dependent. It is just still alpha. I’m working toward a new version, but I still need some time. If you can please consider helping the development by donating. but nothing changed, I cannot set the font size. Do you have any idea, how to? Thanks marco, it worked just great! Hi Marco, could you better explain. I try to copy the qgis.conf but with no changes. I only see the Android/data/org.qgis.qgis/files folders. By using explorer i create a folder named \settings\QuantumGIS with the qgis.conf inside. Am i doing wrong? I modified my QGIS.conf according to your instructions, and now I’ve got QGIS up and running on my Galaxy S3. I also create the conf file but i can’t see any change. My tablet is rooted so i don’t see the folder. So i create a folder settings and put the file inside. Could someone explait how to do it and which software can i use? You shouldn’t have to create any folder: it’s created by Qgis upon install. Create the file ‘QGIS.conf’ somewhere in a normal user folder (/mnt/sdcard/something) with any text-editor, then copy it to Qgis folder, as shown in my post here. cp QGIS.conf /data/data/org.qgis.qgis/files/Settings/QuantumGIS/. (You could copy & paste this line). Thanks Fromax but i can´t see the settings folder in my smartphone. But i il try to do the way that you tell. Well i tryed but “Permission denied” error. Mmm… don’t know what’s the problem here. I used this method successfully on a Galaxy S2, an S3 and an Asus tablet. None of them were rooted. What device and which Android version are you using? My mobile phone is a LG 970. Could some one better explain how to put the conf file. I try to copy the qgis.conf but with no changes. but “Android/data/org.qgis.qgis/files”, the Settings Folder is missing. I have created the structure “Android/data/org.qgis.qgis/files/Settings/QuantumGIS/QGIS.conf”. Is their another option to put this *.conf into? Besides this problem, I saw that if i want to edit a shape file, I only edit data using the table data. And the text is too big to see and I can´t close the table data. Is it normal? I´m using a LG970 Smartphone but i also tested in a 7”tablet and the same has happen. Best regards from Lisbon, Portugal. See my reply further down in the comments. About accessing/copying the conf file: The path has to be exactly “/data/data/org.qgis.qgis/files/Settings/QuantumGIS/QGIS.conf”. The problem is that “/data/” is not accessible if you’re not root (you can’t even see the content of this dir). But the good news is that if you go deeper, then from “../Settings” it is accessible. You must use a terminal to access it. I use “Terminal IDE” (free) but others should work too. Try the command “cd /data/data/org.qgis.qgis/files/Settings/QuantumGIS/” then “ls” to list the content. To copy the file, do (from your homedir) “cp QGIS.conf /data/data/org.qgis.qgis/files/Settings/QuantumGIS/”. To edit, type “vim /data/data/org.qgis.qgis/files/Settings/QuantumGIS/QGIS.conf” (or use ‘nano’ if you’re more comfortable with it!). It’s quite a lot of typing on a small screen, but it can be done. And note that you don’t need to root your device to do this. Hi i just installed qgis 2 on my samsung s2 and is having the oversized qgis interface screen problem. I am trying to follow your instruction on accessing the /data/ directory without rooting. Can you explain further how digging deeper, then from ../setting it is accessible? thanks. installed the terminal ide and then opened it activated terminal emulator, typed in the change directory to “cp QGIS.conf /data/data/org.qgis.qgis/files/Settings/QuantumGIS/”. Any ideas on how to get over the permission thing? As I wrote before, I succesfully added and edited my QGIS.conf on three different non-rooted devices (Galaxy S2, S3, Asus Transformer) using the same method, as described above. Everything beetween `data` and `files` is locked, but from `Settings` to `QuantumGIS` you have read-write (rw) permissions. Maybe it can help you to troubleshoot your problem. Sorry, the links to the images have been stripped. Hi Marco. I have read your post long time ago, but i could never make it work. I have a samsung galaxy Note 1 (the phone, 5.3 inches). But letters are too big. The phone is not rooted. Is any solution without having to root the phone?